Very often, the dental office receives emergency patients who need to been seen rapidly due to dental pain. Our office, if the schedule allows, will see the patient that day for treatment. After an x-ray and clinical exam by the doctor a treatment plan is created. If the tooth cannot be restored with a filling or a crown, the tooth in question will likely need a root canal before restorative work is completed. If the tooth is non-salvageable, or the patient does not value saving the tooth for any reason, the need for removal is the ultimate choice. In the case of the patient who opts to have the tooth removed, there are considerations to keep in mind. The first of which is the patient. Through a series of questions and discussion about the treatment, our team will assess the patient’s anxiety level. We even non-verbal cues to be a useful tool. For the anxious patient, we offer a 0.25mg triazolam (Halcion). Triazolam is a sedative taken orally 30 minutes before any treatment is administered. The patient is instructed to take it in the office in case of any adverse reactions to the sedative. The patient must also make arrangements to have someone drive them home. The spectrum of efficacy of the sedative ranges from a mild stress reliever to extreme drowsiness. We choose triazolam due to its short half-life of 90 minutes. It lasts long enough to accomplish the procedure, but the effects wear off shortly afterwards. Rarely, patients report feeling no effects of the drug. In most of those cases the patient has had a meal prior to administration of the medicine. Patients should not eat or drink 6 hours before treatment. In addition to the sedative, patients also receive one 800mg tablet of ibuprofen and one 4mg tablet of dexamethasone. Ibuprofen is a non-steroidal anti-inflammatory (NSAID) and dexamethasone is a steroidal inflammatory. These two anti-inflammatory medications, taken prior to the extraction, help to reduce pain and swelling at the surgical site after the procedure. Knowing that the post-surgical sensitivity will be reduced by these two tablets helps give an added sense of assurance. Daily patient medications must also be evaluated prior to the administration of the sedative. Pregnant patients do not receive oral sedation. Proper evaluation of the tooth is always necessary. Root formation and proximity are key to assessing the tooth. A surgical hand piece must be ready, in case a root has a bend in it or is located very close to a sinus or nerve. There must be sterile saline used to cool the cutting end of the bur, if the hand piece “drill” is used to section a tooth or remove bone . A tooth that must be extracted with use of the drill is considered a surgical extraction. If a tooth can be removed by merely applying pressure, and no bone must be removed, the extraction is considered a simple extraction. Our patients are always made aware if the extraction will be surgical or simple. 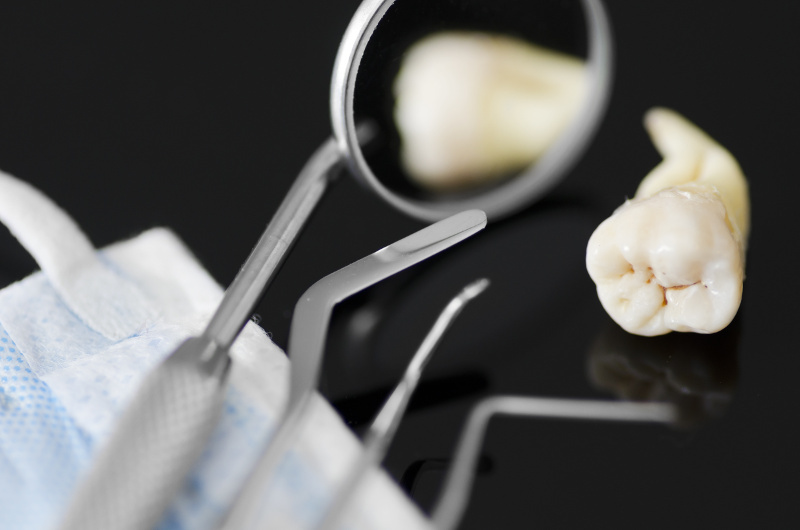 In certain cases, a simple extraction may become surgical if the tooth fractures during removal. Now – let’s get you numb . . . . . . . .